You won’t be able to deny the soft, chewy, pumpkiny, dark chocolatey, sweet yumminess of these Paleo Pumpkin Chocolate Chunk Spider Cookies! I know “spider” is in the name, but the only spiders you’ll be eating are the chocolate ones, dormant on Paleo, gluten-free, dairy-free (with a vegan option), refined sugar-free, oil-free, grain-free, and clean eating cookies! So, what can make a holiday treat that’s tasty and nourishing better, you might ask. 😏 Making them even more fun to eat by sketching little chocolate spiders on them! Again, this is a great holiday baking experience for you and your kids! However, if you don’t have kids, it’s just as exciting to decorate by yourself (I would know 😆) or with loved ones, family, and/or friends! Also you can keep making this recipe all year long by excluding the spiders on top. Nevertheless, Michael and I wanted EVERYTHING in the store, but we knew that wasn’t possible so we each got a few items and we were off to check out. Then, there’s little me—the young, electrified Halloween shopper, who spotted a motion activated spider from the ceiling near the cashier and a big, sticky, harry spider on a shelf in front of me. I shared a mischievous look with Michael, pondering whether we should give our aunt a little scare. I feel SO bad for admitting this, but I went through with it! 😣 I plopped the spider on her shoulder and, sure enough, with a shriek she bounced right under the motion-activated, dropping spider, which gave her another fright! Although it ended with laughs, I still remember feeling so horrible for scaring her afterwards! Start by mixing all the dry ingredients in a large mixing bowl. Then, whisk all the wet in another bowl. Add the wet ingredients to the dry and stir until just incorporated. In the meantime, melt one tablespoon of chocolate chunks or you can make your own chocolate by melting 1 teaspoon of coconut oil and whisking in 2 teaspoons of raw cacao powder and a 1/4 teaspoon maple syrup. The chocolate needs to be a room temperature also, or else it will run right down the cookies. It also helps if you put the cookies in the refrigerator so the coldness hardness the chocolate as you work. Using a tooth pick or similar tool, start by making the bodies by placing drops on the cookies. Then, make the legs! 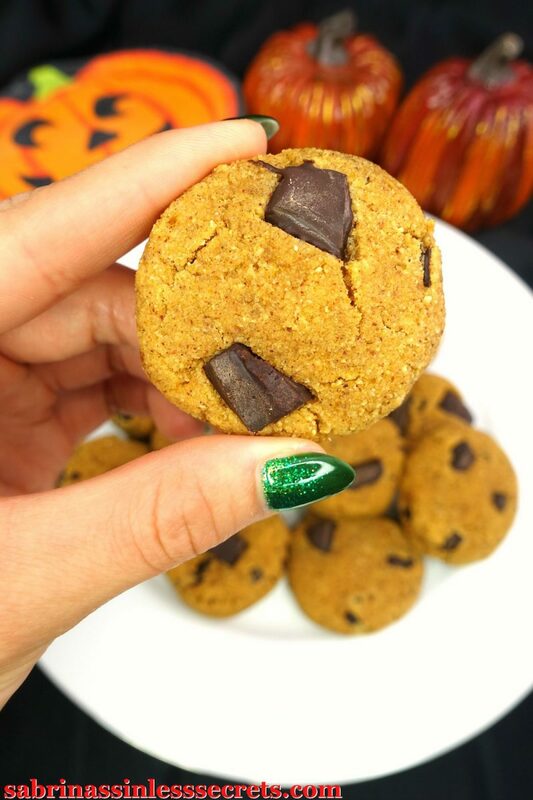 You won’t be able to deny the soft, chewy, pumpkiny, dark chocolatey, sweet yumminess of these Paleo Pumpkin Chocolate Chunk Spider Cookies! I know “spider” is in the name, but the only spiders you’ll be eating are the chocolate ones, dormant on Paleo, gluten-free, dairy-free, refined sugar-free, oil-free, grain-free, and clean eating cookies! Start by lining two cookie sheets with parchment paper or silicone baking mats and preheat the oven to 350°F. Thereafter, add all the dry ingredients in a large mixing bowl and whisk together. Then, whisk all the wet in another bowl. Add the wet ingredients to the dry and stir with a wooden spoon or spatula until just incorporated. Next, fold in the dark chocolate chunks. Using a cookie scooper or heaping tablespoon, roll the cookie dough into balls and place them two inches apart on the cookie sheets. Once you have all the cookies rolled, flatten and shape them to your liking—they won’t spread when baking so make them your desired thickness. In the meantime, melt one tablespoon of chocolate chunks or you can make your own chocolate by melting 1 teaspoon of coconut oil and whisking in 2 teaspoons of raw cacao powder and a ¼ teaspoon maple syrup. The chocolate needs to be at room temperature also, or else it will run right down the cookies. It also helps if you put the cookies in the refrigerator so the coldness hardness the chocolate as you work. Store these cookies in an airtight container or plastic bag in the refrigerator for up to 5 days. These also freeze great for up to 2-3 months!